I've tried Beef Jerky before, but never Biltong. Looking up the difference between the two on the internet, and it seems to be more around curing the beef to create Biltong with salt, vinegar and spices, whereas Jerky is usually smoked, Biltong is not. Kings have marinated and air-dried these strips of lean British and Irish beef to produce their Biltong, with the smokiness added as flavouring. 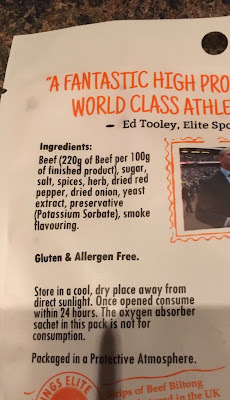 This Biltong is promoted as having "supreme protein", and there are a couple of recommendations for building muscle from sports professionals on the back of the packet. 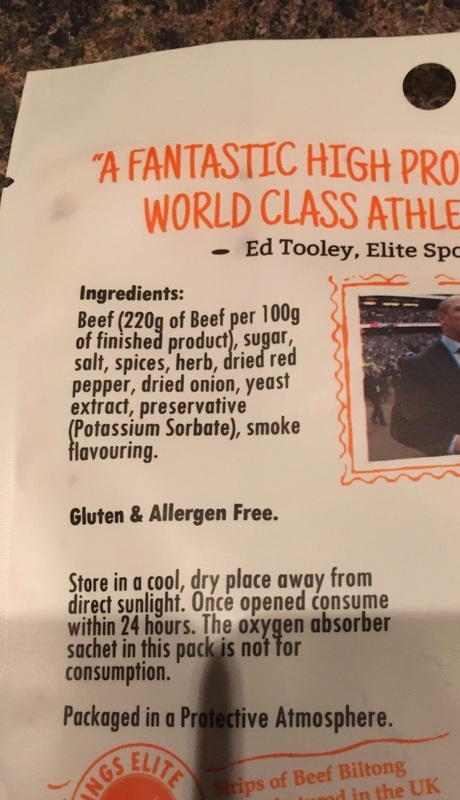 I guess it must be to do with the fact that 220g of beef was used per 100g "of finished product". So what happened, did they push a cow through a car crusher? Anyway, on opening the packet there was a spicy and smoky beef smell, with paprika and red pepper predominately. On tasting the thin strips of slightly reddened beef the spices shone through to begin with followed by a light smokiness to the beef, and then quite a sharp saltiness and perhaps a hint of rosemary moving into the aftertaste. There was a mild heat from the red pepper and paprika to these faintly chewy flavoursome strips of beef. 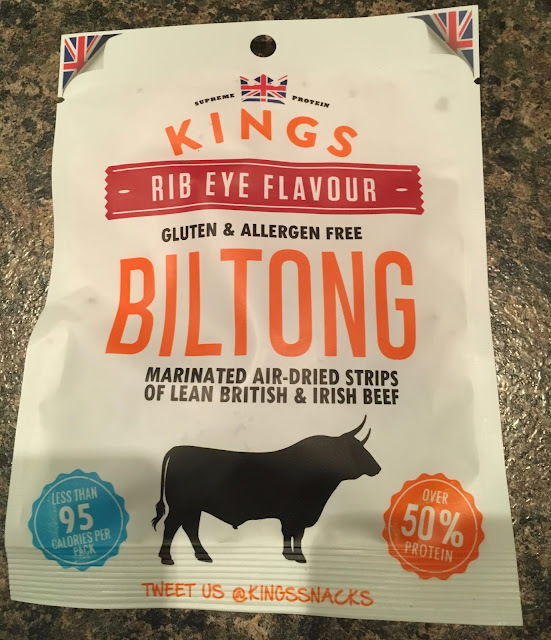 I'd certainly have this Biltong again as a beefy snack with my lunch, especially on the side next to my tuna sandwich for some surf and turf action after a session at the gym. The 35g packet has 266 calories per 100g (less than 95 calories per packet), with 3.98g of fat, 5.9g of salt. This Biltong is gluten and allergen free. Ingredients included; beef, sugar, salt, spices, herb, dried red pepper, dried onion, yeast extract, preservative; potassium sorbate, and smoke flavouring.